Apple has been pretty coy regarding virtual reality when it comes to iOS or any of their other platforms. We mention iOS because mobile VR is quite popular right now, with Android users enjoying promising headsets such as the Google Daydream View and Gear VR. It’s not all bad news for iOS users since thankfully; they can use Android headsets with the iPhone. But what about virtual reality for iPad users? Shouldn’t they be joining in on the fun? The simple answer to that is that major VR headset makers have been kind enough not to make any tablet VR headsets so that users can’t be tricked into thinking that it’s possible. Just imagine how you’d look with a giant tablet strapped to your face. It’s not a pretty or dignified sight, is it? But still, why not let that choice rest with consumers, right? There should be a product for everyone. But we think that 7-inch tablets are where the line should be drawn. Bigger tablets are significantly more substantial and we’d imagine it to will be quite strenuous to support the weight of a tablet with the average person’s neck. Indeed, over a more extended period, the pain could become quite unbearable. That is the major reason why companies haven’t come out with VR headsets for tablets. However, we do understand that there are still people who’d like to experience VR by using their iPads. We’ve compiled a list of VR headsets which will work with the iPad mini. 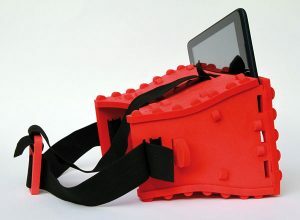 The VR Viewer by Yay3D is a colourful gadget that can be used to experience VR apps and games through an iPad mini. The colour scheme of this headset does make it look like a bit of toy, but the specs on it are quite severe. It’s got a quick attachment system that is built very sturdily and allows for easy adjustment. The headset is quite large, but it’s also very light thanks to an ABS-plastic construction. It weighs just 84g, and due to the ABS construction, it’s very strong. Certainly, strong enough to hold an iPad mini without any worries. The lens used in this headset is gigantic compared to those used in smartphone VR headsets. They’re 50mm short focal length lens that has been manufactured by Yay3D themselves. The lens comes with a precision hard-coating so they won’t scratch very easily. The high-quality lens also enables the headset to provide the user with an impressive field of view of over 90 degrees. The lens can be suggested to suit your facial profile. This is a very rugged-looking VR headset that should be able to house most 7-inch tablets, including the iPad mini. The process of attaching your tablet to this headset is also quite simple. Just place the tablet on the holder on the back of the headset, latch it in place and you’re ready to go. The Durovis Dive 7 features an adjustable strap so you can get the perfect amount of fit. The Stooksy headset for tablets has a very bright colour scheme, which might bother some people. But if that’s not a concern, it’s not a bad VR headset. It weighs about 174 grams, so it’s certainly not a lightweight VR headset. However, the company says that the headset was designed with comfort in mind. The material used in the headset is quite soft and should feel comfortable on your face. There’s a large, adjustable strap to make sure that you get the perfect fit. The lens used is adjustable which means that people who wear glasses should have no problems using this headset. 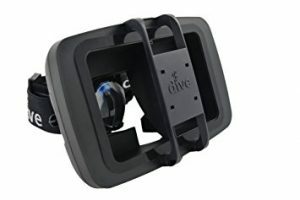 The VR headsets listed above are of quite good quality, but you can certainly get away with a lot less money if you choose to take things into your own hands. Thanks to a few online resources, it’s possible to make your own VR headset for your iPad. The DIY nature of this comes with the added advantage that you can even make the headset fit a larger iPad, but we would highly recommend against that. The larger iPad is far too heavy to be comfortable when used for viewing VR. Getting into detail on how to make your iPad VR headset would be out of the scope of this article, and to be honest, we’re not very handy when it comes to creating optical products. 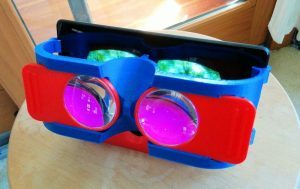 If you’re interested, head on to this Instructables guide on how to make a VR headset for your headset! It won’t be easy but should be an exciting project to work on. Virtual reality is a great way to experience something truly different. In the recent year, we have seen virtual reality technology become incredibly affordable and accessible for a large variety of users. People who’re on a budget can just buy a cheap VR headset that they’ll be able to use with their smartphone. For enthusiasts, the options keep getting better as the Oculus Rift and HTC Vive have come down in price as well. The entry of Microsoft Mixed Reality headsets has also given users an extra option when considering PC VR. Console owners have the choice of the PS VR (PlayStation 4) or the Oculus Rift (Xbox One). So where does that leave tablet owners, indeed, iPad owners? Well, things are a bit more complicated here. While tablets are just as capable as smartphones when it comes to handling the duties of mobile VR, their large size makes it incredibly difficult for them to be used for VR. As you might have noticed, the few VR headsets that tablet owners can purchase are quite large and bulky. This is something that just cannot be avoided. Our recommendation would be to stick with a smartphone if you want a mobile VR experience. What’s more, we could see some standalone VR headsets that can function completely independently shortly as well. Wait for those if you’re planning on purchasing a tablet for VR use. Read our guide to The Most Affordable VR Headsets For an iPhone.